A chance Google search led me on a limited but interesting mission this week. I had a little hunt for which of the Agatha Christie novels people liked most of all. In the list, which took in a lot of titles, there were two books which were name-checked over and over again. It turned out that I had not read either of them (nor seen them on telly, nor been told ‘whodunnit’). It seemed like an opportunity too good to miss so I got hold of them and I read them. In this piece of half-assed research, I was also a little surprised to read how people first came to Agatha Christie’s books and how closely their experiences mirrored my own. Almost invariably, people came to the murder mysteries very early on in their reading lives. Many graduated directly from Enid Blyton and the like. I don’t think this is terribly surprising. Christie write a rather uncomplicated world, in the sense that the goals of the protagonist were not hard to discern and follow. Reading that bit back though, it sounds a bit pretentious. These were simply rattling good mystery puzzles and it was fun to try to solve them along with the little detective, sometimes to fail, sometimes to rather gloriously succeed. For me, for better or worse, it was always Poirot never Marple or any of the others. I’ve written here about my immersive nature of my reading of ‘Orient Express’ as a young kid. Studying the plan of the train, interrogating the suspects along with Hercule, never for a moment imagining the audacious solution until it was too late to claim it as my own. But I digress. On to those two unread favourite books. There was lots of general favourites that I had read. The unavoidable ‘Orient Express’, the very first ‘Mysterious Affair at Styles’ and the very last ‘Curtain’ which I also love. In among these, though, were the two unread ones which had jumped out at me. They were a) The Murder of Roger Ackroyd and b) Five Little Pigs. I got hold of them, one from the Library (it was filed away in the back-of-house area) and the other from the Charity Shop in a nice compendium of four Poirot novels, including my own favourite (see below). The Murder of Roger Ackroyd: Okay. I loved this book. I read it as if I was twelve again, seeking to solve the mystery right along with the inestimable M. Poirot. When I came to three chapters from the end, I stopped and assessed everything I knew and, yes damn it, I came up with the correct culprit. No spoilers here. I can see why this book is greatly favoured and admired. It is archetypal Christie with all the required elements beautifully intact. In reading more about it afterward, I noted that it is often in the running for critic’s choice as the best murder mystery ever written. I also noted, with interest, that Lord Mountbatten played a considerable part in the conception of the very interesting solution. Granted there is an awful lot of stuff happening around the old Manor on the evening that poor Roger gets dispatched and the suspects are, at the end of the day, a familiar enough motley crew of gentlemen and ladies. 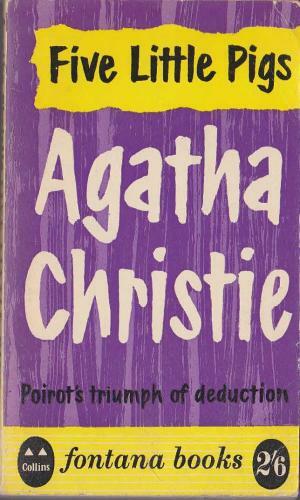 Nonetheless, it is a wickedly clever example of what Agatha Christie did when she was at her very best and you could do a lot worse that getting it and reading it and seeing if you, too, can find the killer... before it's too late. Five Little Pigs: for me, was a surprise entry into the list of favourite books but only because I knew nothing of it. In looking into it, I saw that Christie here took the ‘Moonstone/Rashomon’ approach of having a number of diverse witnesses give their account of a crime from their own particular bias and through the mists of elapsed time. I found it to be a slightly frustrating read because each of the five protagonists must be revisited several times to go over and over their testament. Setting that aside though, it is the solution here that made my sit back and mentally applaud the technical dexterity of Agatha Christie. She really knew people’s minds and, if that was not always evident in the writing, it was certainly evident in the way she could play her audience, the readership, and lead them by the nose to wherever she needed them to go. Without wishing to give too much away, I had this one ‘cracked’ quite early on. Even though I had cleverly worked it all out, I also clearly saw how Christie was leading me away from my conclusions . Further, I saw how she was laying the groundwork for the reveal which I knew had to be right and which would also prove to be satisfying in every respect. It was lovely but, this time, I had beaten her. But Agatha Christie played the Three Card Trick on me and she won and I lost and I absolutely loved the losing. I loved it. To understand the Three Card Trick fully, I think you have to fall for it yourself and I did, once, in Lisdoonvarna in 1980. I was at my first music festival, ragged and wet, with one last five pound note in my pocket to last me for two days. I happened upon a group of rough looking men gathered around another man who was crouched on the ground. He had three cards on an upturned cardboard box and one of them was a Queen of Hearts. The game was simple, as we all know. He shows the Queen, turns the cards over then moves them around face down and, if you find the Queen, you win. If you don’t you lose. I would never play this game. I knew it was a con and that I would get ripped off. I knew all this but, gradually, I knew something else too. I knew how to beat it. There was a small triangular crimp in the corner of the Queen card. The dealer hadn’t seen it but I had. I didn’t need to follow the juggling and slight of hand of the dexterous dealer. I just needed to watch the crimp and note where it went for there lay the Queen. I watched the cards and watched the cards and I had scant regard for where the cards went or how they went there. I knew all I needed to know. When the cards stopped, there it was, the crimped card, there on the right, as plain as day. It wasn’t, of course, for that is the essence of The Three Card Trick. Not that you are enticed to gamble but, rather, than you are convinced that a secret solution is yours and yours alone. The dealer had placed a crimp on the Queen Card long enough to entice me in, then he had expertly taken the crimp out as he juggled and he had put it in one of the other cards. Two days of hunger at a festival teaches you something and I won’t ever be fooled so easily again. Or so I thought. 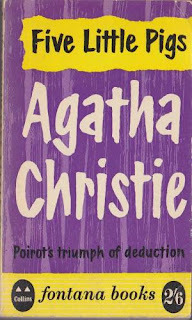 In this book, 'Five Little Pigs', gleefully, rather magically, Agatha Christie, undisputed Mistress of Crime Fiction, played the Three Card Trick on me one more time and took my fiver as easily as if I was sixteen years old once again. I love her for it. If you have a fancy, try ‘Five Little Pigs’ and, even though I’ve warned you of the misdirection, see if you don’t fall for it too. One final point. If someone had asked me, as they asked so many others, what my own favourite Christie mystery book was, I would have said, “Hercule Poirot’s Christmas’. I just thought it was the perfect blend of bloody mystery, privileged suspects and completely left-field solution. Try it sometime, if you have a mind. Ah, yet another thing that I’ve never got round to. I’ve meant to. I even got a copy of The Murder of Roger Ackroyd and set it aside meaning to give it a go but I kept passing over it for weightier works. I’ve watched everything ever televised even the ones where I remember what happens because you don’t watch an adaptation of an Agatha Christie novel for the story; you watch it for the acting in exactly the same way as you do Shakespeare. And the same goes for Sherlock Holmes. On the whole I’ve read very little crime fiction. Carrie’s read tons. She doesn’t read books; she reads entire back catalogues. But then she tears through books at a ferocious pace. As for the three card trick, I’ve only ever seen that on TV. That said, like you, I think I would’ve been foolhardy enough to bet a fiver if I thought it was a sure thing and I’m really not a betting man. The only bets I’ve ever placed were on the Grand National at work when everyone got a horse and I would’ve been a bad sport not to. Never won a damn thing. Or a football sweepstake—you know those cards—and, again, I never won; I just treated it as a donation to whatever charity it was for. Hi Jim, out of interest, I read about how they adapted Roger Ackroyd for the Poirot TV series. I feel that quite a bit would have been lost in the approach they apparently took. Having said that, I think the Suchet version of Orient Express is an almost perfect thing and I would love to see Curtain sometime.